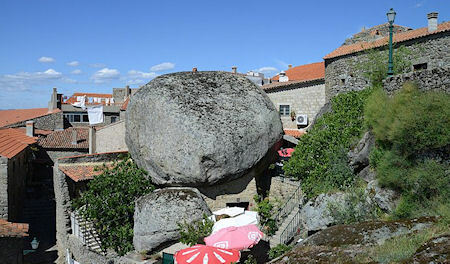 Monsanto is a beautiful village built in the Portuguese countryside. Featuring narrow streets carved from rock and granite houses squeezed between giant boulders, it looks like a real life Bedrock. At the top of the 400 feet high hill stands a very old square built castle. The castle played an important role in Medieval times when the Templars Grand Master built a castle which withstood several battles including the Napoleonic invasions.